I know, I know, another soup. But it’s winter and they are cheap, fast and filling, so get past it. This veggie soup is amazing. It comes from my mother’s Tennessee upbringing, where going to the store to buy things to put IN soup was completely unheard of. Instead, you just used leftover roast and vegetables to keep anything from going to waste. So, over time, this has adapted to be a lot fancier than it started out in rural Tennessee, and in all honesty, probably isn’t as good. But I LOVE it…even requested it for my birthday dinner this year. 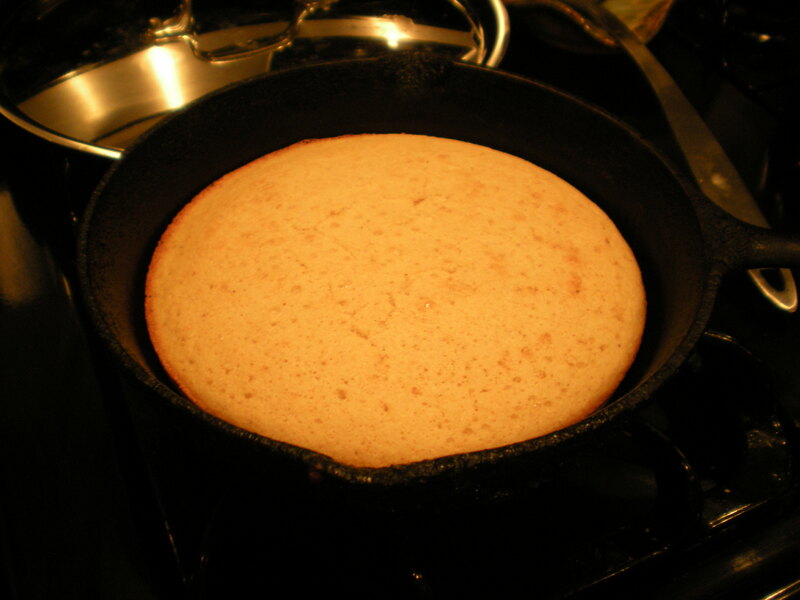 And as for the cornbread, don’t be intimidated. The first time you make bread can be stressful, but this is so easy, only 4 ingredients and takes 5 minutes to prep! Snuggle up under the tree this week with a hot bowl of soup and a slice of cornbread. 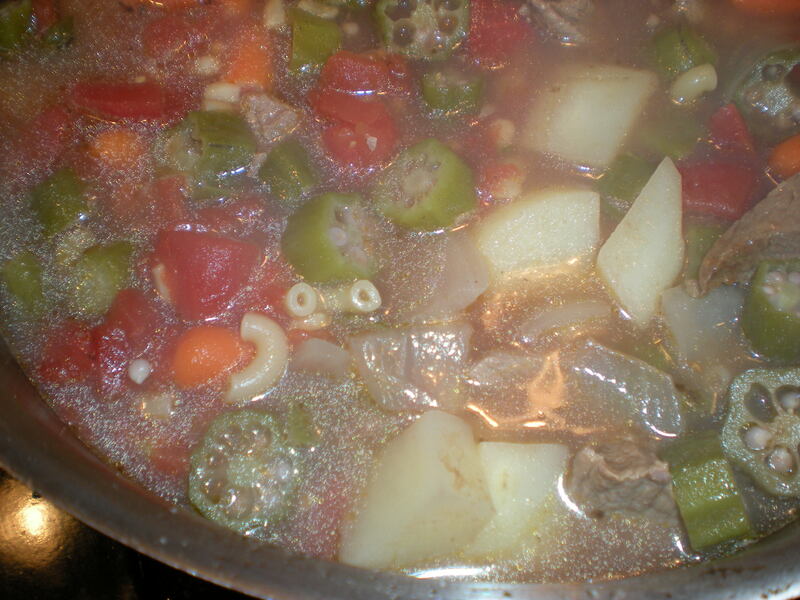 In a large soup pot, fill halfway with water and simmer beef for a least an hour. Then, add boullion cube and tomatoes to the broth. Then, add the rest of the ingredients except the macaroni. I usually add a little more water at this point, just want to keep the veggies covered, and S&P to taste. Let simmer until veggies are cooked. A good test is when the potato is tender and can easily be cut with a fork in the pot. Then, add the V8 juice and elbow macaroni. Soup is ready when the macaroni is cooked, about 5-6 minutes. Serve with a little tabasco. Preheat oven to 425. On the stove, heat the oil in an 8″ cast iron skillet over low heat. You’ll know it’s hot when you flick a tiny bit of water into the oil off the tip of your finger (stand back and hold your hand high over the skillet so you don’t get burned.) If it pops and crackles, it’s hot. While the oil heats, in a small mixing bowl, pour in the cornmeal and then the egg. Then, add about half the alloted buttermilk and mix together with a fork, making a batter. Keep adding the buttermilk a little at a time until the batter is runny and runs off the fork easily when lifted out of the bowl. It’s usually about 1/2 a pint. Then, take the skillet and pour some oil into the batter, mixing well. Pour the batter back into the hot skillet that should now be coated with oil, and bake for 15–18 minutes or until golden brown. Let cool and cut like a pizza. You might be wondering how many different chili recipes I have and how often I cook chili or soup. The answer is lots and often. It’s just so easy, you always have leftovers and it’s filling! You can do this the hard way (cooking the chicken prior to making the soup) or the easy way (buying a rotisserie chicken). Up to you. It’s super-easy and a great winter weeknight meal. My sister-in-law, Lucy, taught me how to make this when I first got married…back when I couldn’t boil water…thanks, Lucy! **If we have a more flavorful, full-bodied beer on hand, I’ll dump a bottle in this recipe sometimes. In a large pot, saute chopped onion in butter or oil. Then, dump in the V8, beans and both cans of tomatoes. Stir well. Dump in shredded chicken, salt and chili powder. Let simmer about 20–25 minutes before serving. Top with a little cheddar cheese. If you want to cook the chicken first, buy a whole frying chicken and remove/discard the gizzards bag. Gross. Place chicken in a large pot, cover with water, dump a healthy amount of salt and pepper in the pot. Bring to a boil and then reduce heat from a rapid boil, simmering the chicken for about 2–2 1/2 hours. Keep water on the chicken; it will reduce down as it continues to boil. This is why you buy the rotisserie chicken or use left-over grilled chicken. Nothing says fall like a hot bowl of chili. This year, I have been on a quest to lighten up my current chili recipe. 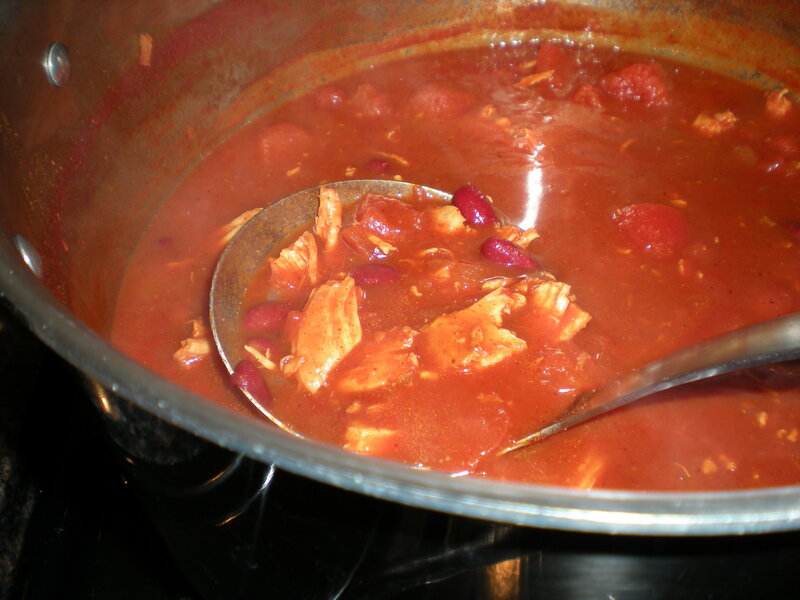 I found this iteration of Springfield Chili on a cooking demonstration from Cooking Light’s Web site. It uses ground turkey breast instead of beef, lightening it up quite a bit. And the no-salt-added tomato sauce, plus rinsing the beans and using a beer instead of broth reduces the sodium by almost a quarter. It’s really, really tasty and you don’t miss any of the beef flavor of chili. Start by cooking chopped bacon in a large dutch oven over medium high heat. Once cooked, saute the onion in the bacon drippings until soft, about 5 minutes. NOTE: if you want to skip the bacon, just put a little olive oil in the pot to saute the onion. After the onion is soft, add the garlic and cook another 2 minutes or so. Add turkey meet and cook, about 6-7 minutes. Once the meat is browned, add the beer and reduce heat. Let it simmer about 7 minutes, reducing down to about a 1/3 cup. Then, add your spices, tomatoes and tomato sauce. Stir and let simmer, covered, for about 30 minutes. Drain and rinse your pinto beans and add to the soup. Rinsing them will also help reduce sodium levels. Continue cooking until the beans are hot. Serve with sprinkled cheddar and sour cream, if preferred, at your next football gathering. A cold beer is non-optional, though. ROLL TIDE! This is my mom’s tomato soup and it’s perfect when the weather gets a little cooler and even more perfect with grilled ham & cheese sandwhiches. It kinda makes a mess, but it’s the perfect comfort food and a great dinner take others. In a large saucepan, heat the oil and butter. Saute the onion until wilted and transparent, but not burned, about 6 mintues. Add the tomatoes and spices and simmer for about 10 minutes. In a small cereal bowl, spoon in the flour. Add just a bit of chicken broth, about 1 tbsp and a 1/2, and mix together to make a paste/roux. Whip it with a fork until all the flour lumps are gone and you have a paste. Add the roux to the tomatoes and the rest of the chicken broth and simmer for about 30 minutes. After 30 minutes, bring the pan off the heat and cool it for just a minute. Pour into a blender and blend together the tomato/onion mixture until smooth. Add it back to the pot and put on low heat. Take the cream and pour SLOWLY, little bit at a time, into the soup, stirring while pouring. BEGINNGERS TIP: the cream will curdle if you just dump it all in at once, if it’s been in the fridge, so you want to introduce it slowly, to adjust to the temperature difference. VOILA! Serve with a yummy, greasy grilled ham & cheese. Perfect for a night in front of a football game this fall.